CANVEY ISLANDERS PUT ASIDE THEIR OUTRAGE at the MPs’ expenses scandal yesterday and took a long hard look at the local issues facing the island. In the Canvey Island East Ward, Brian Wood (Independent) was elected with a majority of 170 over the incumbent Mark Howard (Conservative); and, in the Canvey Island West seat, Ray ‘Mr Canvey‘ Howard (Conservative) was returned with a majority of 293 over the Canvey Island Independent Party candidate, Peter May. In both wards, the turnout was down significantly from the mid fifty-percents of the 2005 election — to just over 34%. The Canvey Island Independent Party can take some solace from the fact that Peter May came a respectable second in the Canvey West Seat; but, given that this seat was a two-horse-race from the outset, that the turnout was a mere 34% and that a large majority of voters were inclined to cast a protest vote in the wake of the MPs’ expenses scandal: they would be hard-put to talk the result up into any kind of endorsement for their island policies. The fact is, the only other candidate that had any hope of gaining from the public outrage was the BNP candidate — and islanders are far too savvy of that party’s particular brand of politics to ever let that happen. In this election, islanders have fired a shot across the bows of the CIIP boat. The honeymoon is over, and, unless the party gets its act together and begins addressing real island issues, the next Borough and Parish Council elections are more than likely to see a revival in the traditional parties’ fortunes. In the Canvey Island East Ward, Brian Wood completed his drubbing of the Conservative candidate, Mark Howard, whom he unseated from the Borough Council last year. AS AN ISLAND COMMUNITY we often choose to forget that our local economy is intricately linked to the mainland. In just three years we have established our own political party; formed a new town council and, with the notable exception of Ray Howard, populated it with members of that new party. We have also been keen to reject mainstream parties when electing our borough councillors, with only the Canvey Island West seat remaining in Conservative hands. On June 4th we will have an opportunity to insulate ourselves still further from the mainland when, in the Canvey West seat, we are given the opportunity of ousting the Conservative Ray Howard with Peter May, the Canvey Island Independent Party (CIIP) candidate. But do we really want a CIIP candidate to represent us at County level? The first item on our policy document has always been to protect Canvey Island and its people, and so if this is ‘playing politics’ then it is a game we will continue to play, albeit a different game to everyone else. Its statement makes clear its isolationist attitude to the island and its residents. An uncompromising position of protecting the status-quo at all costs, with no mention of local business in its policies, or furthering the ambitions of our island’s inhabitants. Even our children are placed one from last at the bottom of its list. Where was the CIIP when it came to protecting local traders from the impact of Lalani’s 99p Store in our High Street? And what has been its response to our local CAB’s desperate needs for additional premises and access to increased funds? The CIIP has given us tree planting; High Street planters; tree planting; lake clearing and, yes, yet more tree planting. All, let us be clear, using voluntary labour at the expense of the local economy (apart from the fortunate suppliers and contractors employed to maintain the island’s cosmetic makeover). Cosmetics in the face of the worst recession since the 1930s, which, the CIIP apparently believes, is only affecting the mainland. While Essex County Council takes the bull by the horns and directly addresses business’ need for emergency funds, where has been the CIIP’s support for the initiative? Where was the CIIP in promoting the new ‘Banking on Essex‘ facility to local businesses and traders? Desperate times call for leadership. The Chartered Institute of Personnel and Development (CIPD) found that only one in five companies plan to hire 16-year-olds due to leave school this year. And a third of firms said they will cut their graduate employees in 2009. Some 45% said they did not aim to recruit from either group this year, underlining the extent of the slowdown. At the other end of the spectrum, figures from the Office for National Statistics show that over the past year, unemployment among people aged 50 or above has risen by 47%. ‘These figures paint an extremely bleak picture for millions of over 50s whose working lives are at risk of being cut short by the recession,’ said Michelle Mitchell, charity director for Age Concern and Help the Aged. ‘Those who do lose their jobs will face significant obstacles to getting back into work, leaving them financially vulnerable as they approach retirement. These are the real issues facing Canvey Island. Issues that, at County level, politicians have the ability to address. Use your vote wisely on June 4th. We need representatives whom are imaginative, with a proven ability to get things done. Planting more trees is just not an option. CANVEY VOTERS ARE REMINDED that the last day of registration for voting, whether by post or in person, is Tuesday, 19th May. Those wishing to register to vote should contact Essex County Council on: 0845 603 7632. Polling will take place on Thursday, June 4th, from 7.00 am to 10.00 pm. Two Canvey Island seats will be contested in this election: Canvey Island East, and Canvey Island West. Laurence Morgan was proposed for this seat by his brother, John Laurence Morgan, another BNP candidate contesting the Canvey West seat. No further details about Nicola Nunn are currently known. John Payne, 76, came last with 95 votes when he contested the Canvey Island West seat in the Borough Council elections in May 2007. He also came last with 151 votes when he fought the January 09 Town Council by-election for Canvey Island’s East Ward. Brian Wood won the Canvey Island South Borough Council election in 2004 and 2008. He is an independent Independent and, although proposed by one (Martin Tucker) he has not joined the Canvey Island Independent Party (CIIP). In 2008, he won the Borough Council Canvey Island South seat with a majority of 218 over the Conservative Party candidate, Mark John Howard. Mark Howard is seeking re-election and has campaigned for the Canvey greenbelt. He was last elected in 2005 with a 299 majority over the Labour candidate. The total number of votes cast was 8,714, and the turnout was 55.97%. Mark Howard received 45.26% of the vote. 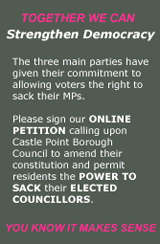 Mark Howard lost his seat on Castle Point Borough Council to the Independents in 2007. He is not related to Ray ‘Mr Canvey‘ Howard, whom is the Conservative Party candidate seeking re-election to the Canvey West seat. Ashley Final is a councillor for Chelmsford Borough Council’s Patching Ward and serves on both their Audit & Governance and Licensing & Regulatory committees. Mr Final told this blog: ‘I am standing as a Liberal Democrat to give people a chance for a greener and fairer Essex. All of Essex County Council decisions reflect on all of the residents. (Be it Council Tax, waste disposal, education — and these are a just a few important issues). ‘I have worked on Canvey Island and know the area. If elected I will hold weekly meetings with constituents. As a Chelmsford Borough Councillor, I can state that I have never claimed a penny in expenses — even when I could. Peter May is the Castle Point Borough councillor representing the Canvey Island Central Ward. He is reported as being concerned about the effectiveness of Canvey’s £12m link road scheme. John Laurence Morgan stood for the BNP in the St Mary’s Ward by-election on 20th December 2007. In the Borough Council elections, in May last year, he polled 18.5% of the vote when he stood for the Canvey North Ward. Then, on 22nd January 2009, he polled 229 votes (20.2%) in a by-election for the Canvey East’s Town Council seat. This is the man that upset the Gulls by posing for a leaflet photograph that showed him standing by the St George’s flag, painted on the gates of the club’s Park Road ground. His brother, Laurence C Morgan, who is the BNP candidate contesting Canvey East, proposed him for this seat. Jackie Reilly came third in the Borough Council Elections of 2004 when she stood for the Canvey Island East Ward. She came last, with a vote of 401, in the March 2008 Parish Council Election for Canvey Island East. She is Secretary of the Castle Point Constituency Labour Party and Branch Secretary for its Canvey Island Wards. Ray ‘Mr Canvey’ Howard is seeking re-election. Mr Howard is also a Castle Point Borough Councillor, and a Canvey Town Councillor too. Bob Spink, Castle Point’s then Conservative MP (who is not named in the Telegraph’s allegations) paid tribute to him in the House, in 2004, as ‘a major player in the Essex flood defence committee‘ following his 35 year service. Mr Howard supports the idea of a barrier between Shoebury and Sheerness as the only viable way of preventing future flooding in the Thames. He was re-elected in 2005 with a majority of 945 over his Labour rival. The total number of votes cast was 7,334, and the turnout was 52.21%. Ray Howard received 50.82% of the vote. Ray has held the County Council seat since 1981. Ray Howard’s son, David, made news last year when he was given 150 hours community service and a six-month jail sentence, suspended for two years, after being found guilty of running brothels with his mother and uncle. Ray Howard is not related to Mark Howard, whom is the Conservative Party candidate seeking re-election in the Canvey East seat. DURING THE COURSE OF THE NEXT NINETEEN DAYS, we should all be prepared to have our precious leisure time invaded by the inevitable door knocking and bell-ringing conducted by the political parties wishing to gain our vote. But just how many of us are actually prepared to take advantage of our home ground and benefit from such situations? All too often we treat the political campaigners in the same manner as an unwelcome salesman; accept their leaflets with a curt nod — and then bin them as soon as the door is closed. But that can be an opportunity missed. By all means close the door in the face of political canvassers, whom are just there to determine how you will vote; but a face-to-face with a political candidate is a golden opportunity for you to gauge the substance of the person before you. In particular, it gives you the opportunity of discovering just how knowledgeable they are about the local issues that are important to you — and how they stand on the matters. Politicians are renowned for answering a question with a question — or simply changing the subject. When this happens, give them another opportunity by simply stating that a ‘Yes or No will do.’ If you still do not get an answer: that is the time to close the door. Any other questions you have will also be avoided; so don’t waste your precious time (and do not bother reading the leaflets). A candidate who cannot give an honest response to your question is not to be trusted (because they are more concerned with themselves or their party than they are in representing your views). Now is a good time to get together with your family and neighbours to discuss local issues and decide how they should be dealt with. Do you live near an accident hot spot? Are you troubled by local youths? Do you know who your local policeman is? Do you see him on a regular basis? Are you pestered by anti-social behaviour? Do Council services meet your needs? If you do not know the solution: ask the political candidate what they are going to do (and how much it is likely to cost residents in their next Council Tax bill). Beware candidates that criticize other candidates or their parties: they are not telling you anything about themselves or where they stand. They are just trying to convince you not to vote for the others, in the hope you will vote for them. These candidates are not worthy of anyone’s vote. Do not be led into a discussion of the MPs’ expenses scandal. It is simply not relevant to the local campaign (unless the MP supporting the candidate has been named by the Telegraph). In this particular election, the chances are that many candidates will want to express their outrage; but they are not in any position to do anything about it — so anything they say can be taken with a pinch of salt. Focus on the local issues. Get answers to the questions that concern you. You are not there to listen to a prepared party speech, which you will have already heard on the radio, or seen on the TV. You are giving them your time — make sure they are prepared to give you theirs. And one last thing: when you open your door, keep the candidate on the bottom step and do not invite them in. You will find it easier to control the situation — and it is important to let the politicians know their own place in the scheme of things. IN THE RUN-UP TO THE EUROPEAN AND LOCAL COUNTY COUNCIL ELECTIONS, which will take place on 4th June, we all need to make our minds up as to which way we are going to vote. But, just as importantly, we all need to ensure that we cast our vote wisely, because the mood resulting from the MPs’ expenses revelations is to boycott the polls in justifiable protest and anger. The Daily Telegraph has moved into tabloid mode in the pursuit of its story. The fact is: it is not a case of investigative journalists presenting a balanced report to the public they serve — it is all about circulation figures in the midst of a recession and milking a single angle that is designed to sell as many copies as possible. If you follow the link, you will find thousands of words devoted to miscreant MPs and their expense claims; but you will not find a single article devoted to that vast majority of MPs whom have felt morally obligated not to participate in their colleagues’ gravy train and purposely refrained from claiming the expenses to which they were entitled. Do not be misled by the story. The fact is that that there are far more MPs in the House of Commons than the 108 named by the Telegraph (which is, statistically, some 16%). The danger is that the paper, by choosing to release its information on a piece by piece basis (as though the story was constantly evolving) hypnotizes us all into believing that every MP has been named — whereas the truth is the exact opposite; whereas the truth is the Telegraph has sat upon this information for some considerable time; and whereas the truth is that it has chosen NOT to publish the single, properly balanced, ‘Special Edition’ that is to be expected from a National Title brandishing the Telegraph’s masthead. This is not Watergate — it is a cynically manufactured ‘trickle-gate’ with the sole object of maximizing profit. Objectivity, along with responsibility, has been cast to the wind (and I never thought I would be saying that about the Daily Telegraph). The danger is that the newspaper’s sensational approach to its material will further undermine the public’s already low opinion of Parliament, and that democracy will be fatally wounded as a result. Let us not let that happen. Our children already have enough to face with replenishing the government’s coffers after all its quantitive easing, along with an inadequately funded state pension system to support. Do not let us leave them with an ineffective political system as well. Use your vote on 4th June, and cast it on local issues. Vote for the person and their policies — not the party. Do not align yourself with the armchair anarchists; but, instead, make democracy work.